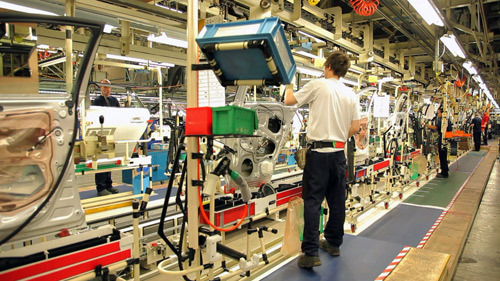 Lean manufacturing is often presented as an improvement strategy in which employees improve business processes themselves, in small successive steps (Kaizen). However, for real breakthroughs you also need a strategic vision, to which the improvement work can be directed. For that, you need to make a so-called future state value stream map (FSVSM), for each family of products or services that your company delivers. During a workshop, organized by the University of Groningen in the Netherlands, professor Dirk van Goubergen expounded his recipe to make a good FSVSM. Ideally, every value stream starts with the raw materials and ends with the consumer. 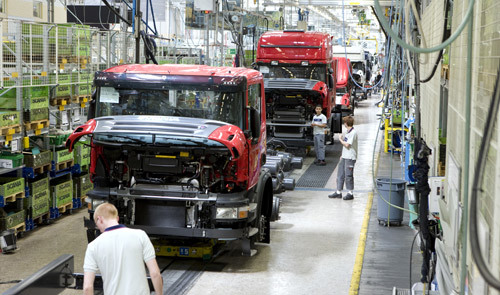 In practice only companies with a lot of experience, like for example truck manufacturer Scania, are ready for such a broad scope. Less advanced players usually start less ambitious, for example with one department. That way, visible results are attained quicker. The risk of local (sub)optimization is then seen as unavoidable. This is no problem, as long as a local approach is only applied temporarily. What is Lean?, asks Dirk van Goubergen at the beginning of his workshop1 value stream mapping. He is both consultant (at Van Goubergen P&M Productivity Improvement) and professor operations design at the University of Gent in Belgium. Besides me there are about twenty other people in the room of the Hampshire Hotel in the city of Groningen in the Netherlands. Half of the workshop participants is from industry, the other half works in healthcare. ‘Lean is creating flow! Lean is maximizing the value for the customer!’, some people respond to Goubergen’s question. 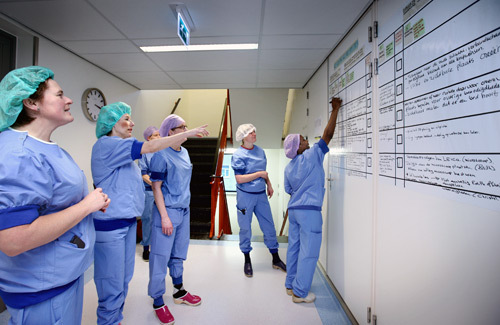 Lean in the Dutch hospital VU Medical Centre. Improvement options are discussed in front of an improvement board. Often, creating pull is added, which means customer driven-production. However, that is already implicitly part of the five principles above. Producing something that no-one has ordered does not add value! When you want a real breakthrough, and this is what Van Goubergen is aiming at, then you need to develop an improved process design first. Only after that principles like standardization and creating visibility become useful! In the beginning the scope of a value stream can be restricted. For example to one factory or even one single department. However, ultimately the value stream should begin with the raw materials and end with the receipt of the products or services by the customers. Improving a value stream is a repetitive process. Therefore the scope can be easily broadened with every cycle. As a rule, in the beginning the amount of intermediate stock is however very high. Van Goubergen hands out a piece of paper of A4-size, with the current value stream of a fictional company on it. The throughput time of the product family represented by the value stream is one month, while the processing time per individual product is only a couple of minutes! ‘How do you to improve this?’, Van Goubergen asks. A few of the reactions from the audience: ‘Reduce the changeover times! Shorten the cycle time of the bottleneck process! Only allow a pile of stock in front of this bottleneck!’. A lot of those ideas can be traced to the Theory of Constraints of Eli Goldratt. I add the suggestion to ask a student to simulate the value stream on a computer. After that a better one could be designed by making adjustments. After all, the workshop is organized by a university. The final result of our brainstorm: A lot of improvement points without any focus. This is the result you get when you apply Lean from bottom up without any direction, I understand a bit later! A good value stream flows as quietly and continuously as a river in the lowland. However, the value stream we see on the paper that lies in front of us resembles more the chaos people undergo when they visit an amusement park: long waiting times, lots of useless walking, and only a few minutes valuable time when they experience an attraction! Therefore, our first step is to calculate the takt time of the value stream. This is the production rate that is just sufficient to meet the demand. When the creation of a OPF fails, the second choice should be examined. This implies the placement of a buffer between the two production steps, of a fixed maximum length. Within this buffer the sequence of the production orders remains intact. This means that it is a first in, first out (FIFO) pipeline. In addition, a pitch size is selected, named after the pitcher in a baseball game. ‘The pitch is the amount of production orders that is released each time, this is also the amount of work of which it is immediately visible if it is completed on time. This is comparable with a bus that arrives timely at a station or not. This completes our future state value stream map! Van Goubergen made an adjusted version of his a step-by-step plan for the development of future value streams for services. A typical application is the redesign of a value stream which runs through an office or through a hospital. Van Goubergens’ approach to make future state value stream maps is logical and interesting. However, a few questions arise. As stressed by Van Goubergen, each value stream should be re-evaluated after each change of the takt time. Today the demand is extremely volatile so this will happen an awful lot! More about this subject can be found on our site-section Quick Response Manufacturing. Finally, one question remains: What to do if not only the demand varies, but also the product mix? If you know the answer, please share it with us, for example by posting on our forum!